Back to back to back – that’s how Terrence’s schedule at Wynn Fitness Club Downtown Toronto looks like, day in and day out. Armed with supreme knowledge and fun approach to each workout session, he is adored by his many clients. As a Personal Trainer and Physio Therapy Assistant, his philosophy focuses on continual lifelong learning as he works towards enhancing the well-being of his clients empowering them with the knowledge, skills, support, guidance, and resources on their journey to a healthier life. 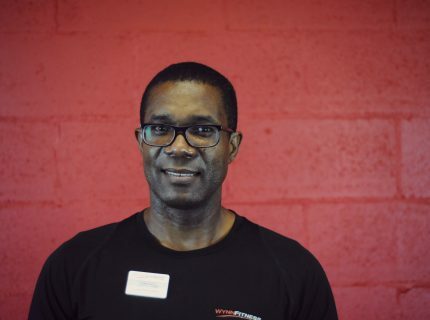 Terrence holds Professional Fitness Consultant Diploma from Medix School which includes Anatomy and Physiology, Exercise Physiology, Kinesiology and Wellness and Nutrition. He also holds the following certifications: NSC Certified Personal Trainer, Can Fit Pro Certificate, Can Fit Pro CPR, Can Fit Pro Weight Management 2.0, Essentials of Eccentric Training, Strength Training for Fat Loss and Facilitated Stretching. He is certified alright, but besides his passion for fitness, he enjoys traveling, cooking and meeting new people. You would be surprised to know that before starting his career at Wynn Fitness Clubs in 2012, he was in the entirely different field; he worked as a Training Manager for 18 years for one of the big chain restaurants! See Terrence now and what he loves to do the most. Take a listen to what some of his clients have to say about him. Hit play.